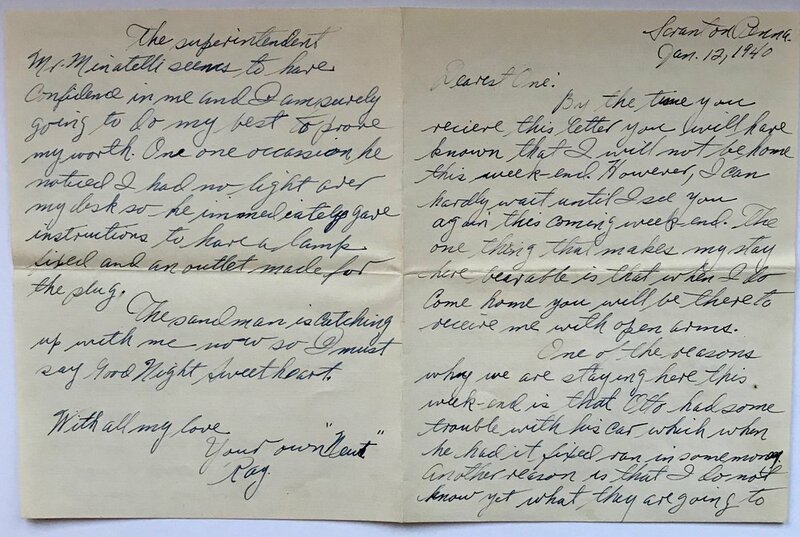 I'm continuing my series of scanning, transcribing, and annotating my grandfather's love letters to my grandmother leading up to their marriage in June 1940. In this letter, Grandpa is getting settled in Scranton during his first week there. When he's not working at the factory, he's eating out, playing pool, shopping, and going to the movies. He also attends church, which he made sure to include in his letter because my grandma would've approved. Nice play, Grandpa! One of the challenges I'm facing is determining when Grandma and Grandpa met, when they started dating, and when they became engaged. One of the advantages of setting up family archives (which I discuss in detail in my book, Creating Family Archives: How to Preserve Your Papers and Photographs) is that you can easily conduct family research. I'm using my photo archives to enrich and inform my paper archives, and vice versa. In my photo archives, I have this picture which shows my grandparents together four years before these letters were written. Were they dating already in 1936? That seems an awfully long time before they became engaged which I'm assuming was in 1939 or 1940. I find the body language in this picture intriguing. Who was taking the picture? I wonder if it was my grandmother's stepfather--who was, from all accounts, a very abusive man. Everyone stands with their arms crossed. There's a noticeable gap between my grandparents with their arms crossed away from each other. It seems to me as if they're aware that they can't show too much affection, especially in front of parents. They both look happy though, while Joe looks like a typical sullen teenager! Some things never change. By the time you recieve [sic] this letter you will have known that I will not be home this week-end. However, I can hardly wait until I see you again this coming week-end. The one thing that makes my stay here bearable is that when I do come home you will be there to receive me with open arms. One of the reasons why we are staying there this week-end is that Otto had some trouble with his car which when he had it fixed ran in some money. Another reason is that I do not know yet what they are going to pay me therefore I have to watch my pennies for a while. However, this may be cleared up by Monday as I expect Mr. Meyers to be up here then. This will no doubt be a long week-end for both of us but we have next Saturday to look forward to. Otto and I plan to go to work for a half a day tomorrow (Saturday) shop for a while in the afternoon and then play pool in the recreation room where I am boarding. On Sunday it will be church; perhaps a little ride and then a movie at night. There is a small business section a few blocks from where I board. It is here that I have my breakfast every morning and where we went to a movie on Wednesday. Believe it beloved that whatever I may do this week end may make me miss your loving company all the more. Though I have not asked any questions concerning rooms, rents etc. I do not think you and I would have very much trouble finding good rooms. The section near the mill isn't a very good one but the section on the hill overlooking it seems to be alright. The superintendent Mr. Minatelli seems to have confidence in me and I am surely going to do my best to prove my worth. On one occasion he noticed I had no light over my desk so he immediately gave instructions to have a lamp fixed and an outlet made for the plug. The sandman in catching up with me now so I must say Good Night, Sweetheart.